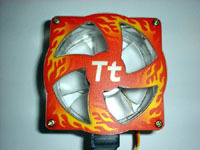 One of the newer products on the virtual shelves at Pham Computer is the Thermaltake Fireball Fan. Basically, its an 80mm, tri-color LED fan fitted with a fan grill that has embedded EL lighting that creates the effect of fire circling the face of the fan in a counter-clockwise direction. 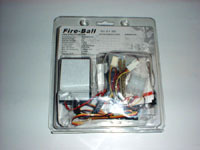 All of the items pictured on the left are included with the Thermaltake Fireball Fan kit. Going clock-wise from the upper left corner, you have: 1) A detailed instruction sheet, 2) The 80mm fan with fireball grill pre-installed, 3) All of the wiring attached to the fan and the grill, 4) a plastic bag containing a set of longer bolts and wire splitter to allow use of the 3-pin speed sensing lead and the 4-pin power connection, and 5) the power inverter/switch combo. 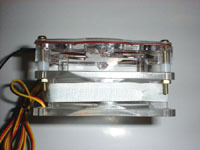 The 80mm fan with pre-installed grill is pictured in the two images below. The design of the grill features the flame pattern which will light up when fully installed, and the openings left for air to pass through look a little too small, and might restrict airflow. Not a problem... Taking a look at the fan from the side reveals that the grill is actually elevated off of the face of the fan, more than compensating for the small openings in the grill, and plenty of air should be able to flow through the fan... Even if you used the fireball grill on a fan with a much higher airflow rating than the one provided, there shouldn’t be a problem. 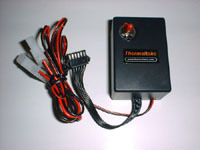 The image on the left shows the inverter/switch combination with its attached wiring harness. Although the fan receives its power directly via a 3-pin connector that you can use with an included 3 to 4-pin adaptor, the grill requires its own source of power. The inverter is obviously necessary to supply the power to the EL lighting of the grill, but the enclosure seems a bit large to me, and people looking to conceal this within their case may have problems doing so. Once you do find a home for the black box, just expose the adhesive on the backside, and stick it in place. 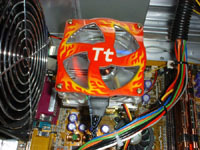 The Thermaltake Fireball Fan was probably developed for use as a case fan, especially considering the relatively low airflow of the fan provided, but for the purposes of this review I decided to install it on a heatsink for use inside a case with a window. Using the extra set of longer bolts, the Speeze Vulturespin accepted the Fireball Fan easily, and it was ready to be installed in no time. The 2000 RPM, 27.8 CFM rating of the fan may be a bit low for regular use on a processor heatsink, but you can always use the fireball grill on any other 80mm fan of your choice! 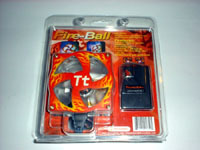 The two images below are animations of the Fireball Fan in action... The one on the left is my attempt to capture the action as an animated gif, and the one on the right is a Macromedia Flash file created by Thermaltake. 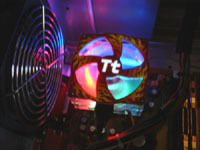 The Thermaltake Fireball Fan from Pham Computer is a unique item that provides a very cool lighting effect for your pc. 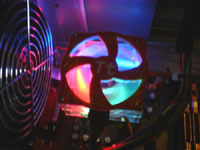 Available for $19.99, the price from Pham Computer is competitive with other online retailers, and is a pretty good deal considering that you might pay $5 to $10 for a tri-colored LED fan by itself, and another $5 to $10 on a statically eluminated fan grill. 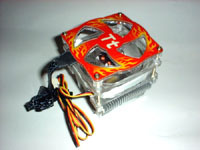 So, for about the same amount of money (or just a few bucks more), you have the added bonus of the unique chasing flames on the Thermaltake Fireball Fan. 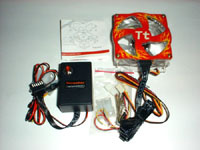 Special thanks to Pham Computer for providing the Thermaltake Fireball Fan for review!